In this MyDigitalSSD 480GB (512GB) OTG V2 SSD Review you will learn everything about the drive. If you are looking for the Best External SSD than you are landed at the right place. Today we are going to unveil all the hidden facts & figures about the MyDigitalSSD 480GB (512GB) OTG V2 SuperSpeed USB 3.1 Gen 1 Portable SSD. With the MyDigitalSSD it is super easy to manage and organize the favorite Applications, games, photos, music, important documents, and even the entire OS with the OTG V2. It is easy to fit in the pocket. The MyDigitalSSD 480GB (512GB) OTG V2 Superspeed USB 3.1 Gen 1 is ready to deliver incredible data transferring speeds up to 456 MB/s for data reading and 445 MB/s for data writing in the USAP enabled devices. It allows the users to run OS, games, media, programs, and other important computing software directly from the OTG V2 anywhere and anytime. The design of the drive is super-efficient to fit in the palm of your hand. The whole dimensions of the MyDigitalSSD is less than the size of a business card and the weight is just 1 ounce. All these features make it an ideal SSD drive to take anywhere. But you must handle the device with extreme care because it is neither waterproof nor the crushproof. 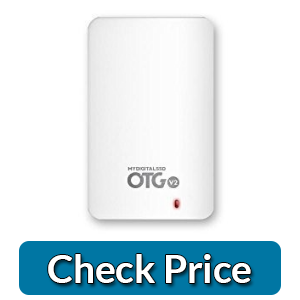 The OTG V2 is also 4 times faster as compared to the spinning hard drives and also utilizing the Solid State Drive technologies in order to offer maximum protection to the users’ data. It also minimizes the risk of losing data during the day-to-day bumps, drops, and shakes and offers you the lifetime computing. Undoubtedly the OTG V2 is an ultimate storage gateway between multiple computing device. We just need to plug the device in the port it will play its role automatically. It is also offering fully backward compatibility with the USB 1.1, 2.0 and 3.1 Gen 1. It also comes up with the 2 different cables one is 8-inch USB 3.0 cable and second one is 18-inch USB type-C capable for the proper use in the USB-C Compatibles laptops, tablets, and smartphones. Finally, here are some of the stunning features of the MyDigitalSSD 480GB (512GB) OTG V2 SSD which are the real reasons of grabbing the attractions of the buyers. Must have a look before proceeding. Offering maximum data transfer speed for the reading 465 MB/s and for writing 445 MB/s. It really consumes really low power. Consists of Interface USB 3.1 Gen 1 which Support UASP. Super Speed 3.1 Gen 1. One of the best & most adopted external Solid-State Drive. No need of battery or external power supply. The manufacturer is offering 3-years of warranty. You will definitely experience more features one you grab it and start using it with your PC, laptops, and other computing devices. Backward compatibility with the old versions of USB. Lack some more advance features. To sum up all, the MyDigitalSSD 480GB (512GB) OTG V2 Superspeed USB 3.1 Gen 1 portable SSD is really amazing & astonishing device offering high-speed data transferring without breaking the bank of the users. So, what are you waiting for? Grab it now!